This exhibition showcases recent paintings by the remarkable family of four talented artists from Iylenty (also known as Mosquito Bore), Utopia: Nancy Kunoth Petyarr (1934-), her daughter Elizabeth Kunoth Kngwarray (1961-), son-in-law, Elizabeth's husband, Cowboy Loy Pwerl (1941-), and his daughter, Genevieve Kemarr Loy (1982-). 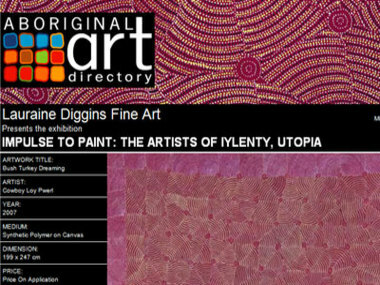 "Painting as the mode of visual expression is imbedded in the fabric of indigenous culture. Aboriginal children encounter the process of painting in their everyday lives as they watch their elders create ceremonial designs ephemerally on bodies and in the sand, and, professionally, on canvas. The impulse to paint, whether innate or acquired, is therefore encouraged by example, and the intricate patterning imbued with ancestral legends and spiritual significance is taught in turn during induction ceremonies. This rite of passage will ensure the survival Aboriginal culture for generations to come." Excerpt from the essay by Eugene Barilo von Reisberg, published in "Impulse to Paint: The Artists of Iylenty, Utopia", Lauraine Diggins Fine Art, 2008. Catalogue available by request, $16.50 (inc. GST, plus postage and handling).